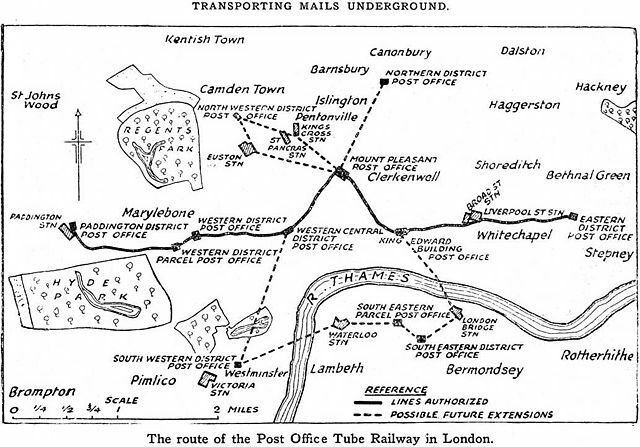 The map above shows the route of London’s Post Office Railway (better known as Mail Rail) in 1929. It operated beneath London’s streets from 1927 until finally shutting down in 2003. Only the central section (solid black line above) was ever actually opened, since all the other extensions failed to materialise. At its peak it had 8 stations and ran for a total of 6.5 miles (10.5 km) between Paddington’s Head District Sorting Office in the west and Whitechapel’s Eastern Head District Sorting Office in the east. The network was built by the Post Office with help from the Underground Electric Railways Company of London (aka London Underground). The largest station was the Mount Pleasant sorting office in Clerkenwell, which is currently undergoing redevelopment. The railway itself was 2 ft (610 mm) narrow gauge and was driverless, 60 years before the DLR. The railway closed in 2003 due in part to the relocation of various sorting offices over the years and more importantly the claim that it cost 5X more to send mail via Mail Rail than it did to use regular delivery trucks. However, there is a happy ending to this story. Mail Rail will be back in business starting in July 2017, although only as a tourist attraction at the new The Postal Museum located at the Mount Pleasant Sorting Office: Phoenix Place, London WC1X 0DA.